One of the cruise industry’s most high-profile celebrity chefs is Food Network mainstay Geoffrey Zakarian, who created the Ocean Blue seafood restaurant on Norwegian Breakaway and Norwegian Getaway. His signature dish is Dover sole, but the eatery also offers selections made with fresh prawns, scallops, mussels as well as duck and steaks. Cost: $49 for adults, $24.50 for children. Or grab oysters, shellfish and sushi right next door at The Raw Bar (a la carte pricing). Zakarian currently has two restaurants in New York City — The Lambs Club and The National — as well as The Water Club at Borgata in Atlantic City. Starting later this year, he’ll become culinary director at The Plaza Hotel in New York City with responsibility for the iconic Palm Court, the Oak Room, Oak Bar and room service. 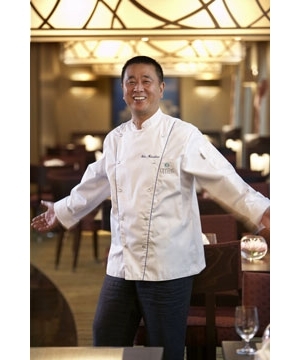 World-renowned master chef Nobuyuki “Nobu” Matsuhisa personally trained the chefs at the Silk Road restaurant and The Sushi Bar on both the Crystal Serenity and Crystal Symphony. Nobu blends Peruvian and European influences with his classically styled Japanese foods for dinner only. Among the options: Nobu-Style Black Cod marinated in miso and broiled with ginger and peach; grilled Wagyu beef rib-eye with wasabi pepper sauce. The Sushi Bar offers sushi and sashimi, including salmon tartar and yellowtail sashimi with jalapeño. Crystal guests can dine for free once per cruise; additional reservations, granted on a space-available basis, are $30 per person. 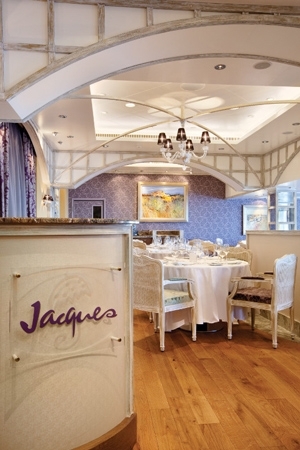 Highly regarded French chef Jacques Pépin — familiar to U.S. audiences for his PBS cooking shows and books, and one-time personal chef for Charles de Gaulle — oversees a bistro bearing his name on the Riviera and Marina. The menu features updated spins on traditional favorites — onion soup with a gruyère crust, escargots in garlic butter, bouillabaisse, Provençale-style sautéed jumbo shrimp, steak frites, Dover sole and duck a l’orange — as well as succulent meats roasted in the eatery’s rotisserie. After all, what’s a French bistro without a roast chicken? Guests dine here at no additional charge. 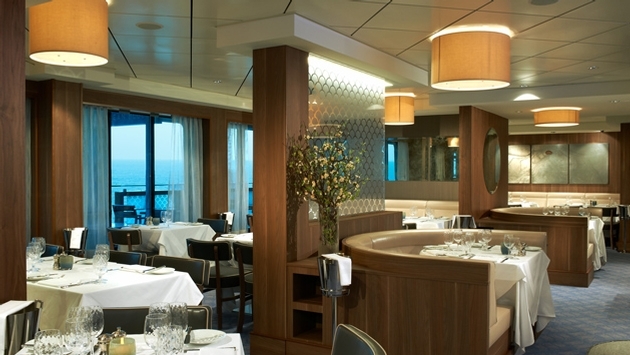 Todd English on QM2 has a la carte pricing. A signature second course, “Todd’s Truffled Potato Love Letters,” features potato ravioli with truffle butter, parmesan and Madeira glaze ($7). For entrées, rack of lamb with a North African sausage samosa and parsnips is $18, while pan-roasted sea bass with a charred summer bean salad and octopus skewer is $16. You haven’t heard of him? Foodies, especially those with an international sensibility, are keenly aware that this Dutch chef was awarded three Michelin stars for his restaurant De Librije in Zwolle, Netherlands. It makes perfect sense that Holland America Line would want to feature a chef who shares Dutch roots. 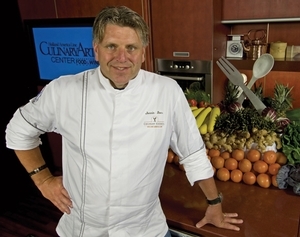 Boer also is a member of the premium line’s Culinary Council that offers expertise on onboard cuisine. 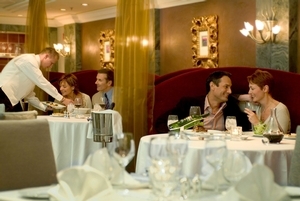 The new alternative dining option called “Taste of De Librije” is offered once per cruise on the Rotterdam and Eurodam in the Pinnacle Grill. A sort of pop-up restaurant, the service staff wears the same uniforms of the land-based restaurant and the tables are set in the same way. The menu starts with North Sea scallops for all diners, who then can choose venison loin and beef tenderloin with bulgur wheat and smoked olive oil foam or perhaps the duo of lamb loin and crusted lamb neck with lentil sprouts, watercress, carrot coulis and lamb jus reduction. Reservations are recommended; price is $69 including a wine pairing. Love him or hate him, there’s no denying that ubiquitous Food Network annoyance Guy Fieri has created a hugely popular poolside burger eatery for Carnival — “it’s off da hook,” to borrow the chef’s parlance. The burgers are big and juicy and paired with hand-cut fries and a variety of condiments and toppings. 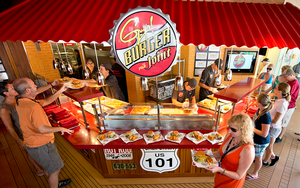 Guy’s Burger Joint is available on the Carnival Breeze, Carnival Conquest, Carnival Glory, Carnival Liberty, Carnival Sunshine, Carnival Triumph and Carnival Freedom. Royal Caribbean International’s new Quantum of the Seas will feature an eatery created by popular British chef Jamie Oliver, a/k/a “The Naked Chef,” cookbook author and proponent of healthier eating. 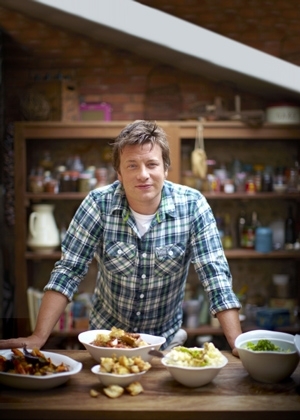 Jamie’s Italian will open in November on Quantum and in April on sister ship Anthem of the Seas. The menu will feature rustic Italian favorites — such as pumpkin-filled pastries and prawn linguine — as well as his famous antipasti selections served on a wooden plank. It will charge a service fee of $15 for lunch and $25 for dinner. Here’s a video sneak peek of what he’s planning.